Clarinet products the beautiful sounds, which is the reason why it’s an amazing instrument to learn to play! If you’re looking for the best clarinets for beginners, then check out this helpful purchasing guide. I review the top five clarinets and offer advice on how to select one suitable for you. Clarinets are made of either plastic or wood. Those made of plastic are best made for students, which are lightweight and easy to handle. Advanced students usually use clarinets made of grenadilla, African blackwood. There are different models of clarinets, depending on the playing situation you’re in. Soprano clarinets are most common, with a sub-family having different tunes. The Bb clarinet is best used for students and beginners, used for many kinds of music. 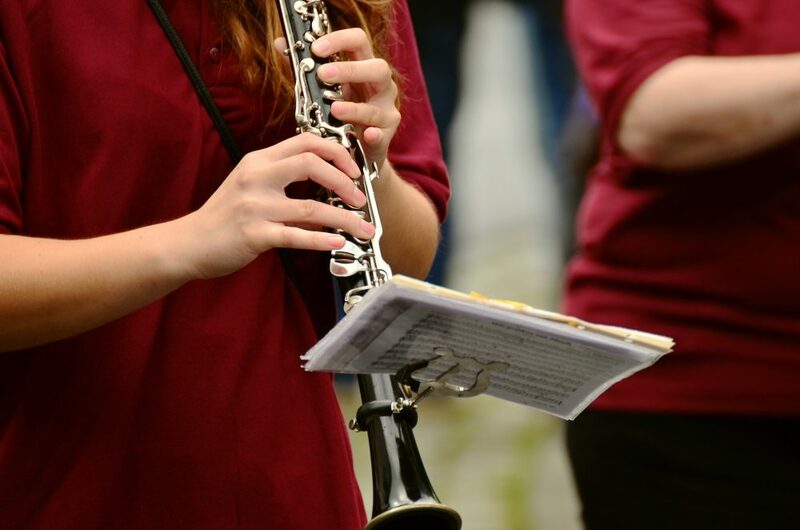 There are other accessories that can make or break the way you learn to play the clarinet, from reeds to change up your tunes, as well as thumb rests and cleaning accessories. What makes the Jean Paul USA CL-300 Student Clarinet the best is its excellent quality. It has a thinner vamp cut designed to make it easier to play for beginners, as well as all the accessories needed to learn how to play. It even has the strong carrying case to make it easy to bring your clarinet around. As for the clarinet itself, I admire its professional appearance and its good tone and key action. With a few upgrades, you’ll be able to continue learning as you progress up to intermediate levels! Mendini is well known for their quality instruments, and the B Flat Clarinet is no exception! It comes at such an affordable price and is made for students, including a beginner’s book, case, stand, and even cleaning accessories to get you started! While the gloves aren’t the most useful, it’s a thoughtful addition beginner will like to use at the start. As for the clarinet itself, you’ll appreciate its strong body made of high-grade ebonite and nickel-plated keys. It’s what helps give a good tone that stays consistent the entire time you use it. With its low price and adequate sound, it’s worth the investment. The Hisonic Signature Series 2610 Orchestra Clarinet might be a bit more expensive compared to other beginner clarinets, but it’s the premium quality that makes it worth the investment. Upon receiving the package, you’ll be surprised by its excellent quality. The casing is strong and includes much-needed accessories for playing, with the strong clarinet body and the mouthpiece with reed protector. The clarinet has the nickel-silver keys which are comfortable to play with, producing the bright tone many will enjoy. After a few months of using it, the sound and feel stay the same, making it great for both practices and small performances. The Mendini by Cecilio Clarinet is another great instrument created by Mendini, suitable for students and beginners. The high-grade quality and durable keys are what make it worth the investment, especially since it comes with the complete package for students to begin learning. You can even choose between many colors, depending on what you like! The clarinet offers the nice sound, which stays consistent no matter how long you play it for. All in all, a simple investment that does the job. Our "Lazarro" clarinets are perfect for any occasions: lessons, concerts, bands and orchestras. We follow USA Standards for our Clarinets, that is why they are teacher and school approved. We are a USA Brand that you can trust 100%. Our clarinets are not just stylish, but also very durable, have great sound quality and are always hand checked by our professional team in New York. "Lazarro" clarinets are manufactured by International Standards, regardless of the colors and keys, and feature the same sound quality, mechanisms and durability. The Lazarro Clarinet comes with the many extras and colors to choose from, which is what makes it worth buying. It isn’t only affordable but made of decent materials which do the job in producing the adequate tone and sounds that can be used for both school performances and lessons. You’ll be surprised that with its price, it comes with the complete package and does the efficient job in helping you learn the ropes. Sure, it doesn’t sound as rich and mellow, but for its price, you get more than what you pay for! After much research and tests, the Jean Paul USA CL-300 Student Clarinet is best. Made for students and beginners, this handy and lightweight instrument produces the fine sounds and has the excellent quality made from the famous company, Jean Paul. And with its starter bundle, you’ll be able to learn how to play right away! I hope that this article on the best clarinets for beginners gave you an idea of what to invest in. So don’t wait any longer and check out these brands now. If you have any questions or want to share your tips and reviews on these clarinets, then comment below. Your thoughts will be much appreciated.